TOKYO — Asian shares were mostly higher Monday after a buying spree on Wall Street kept up investor optimism into a new week, despite continuing worries about trade tensions. KEEPING SCORE: Japan's benchmark Nikkei 225 rose 0.5 percent to 21,784.87, while Australia's S&P/ASX 200 fell 0.7 percent to 5,693.30 in early trading. South Korea's Kospi gained 0.3 percent to 2,099.45. Hong Kong's Hang Seng added 0.6 percent to 26,331.84, while the Shanghai Composite stood at 2,693.93, also up 0.6 percent. Shares were mostly higher in the rest of Asia, with benchmarks rising in Taiwan and Indonesia. WALL STREET: The S&P 500 index rose 6.07 points, or 0.2 percent, to end the week at 2,736.27. 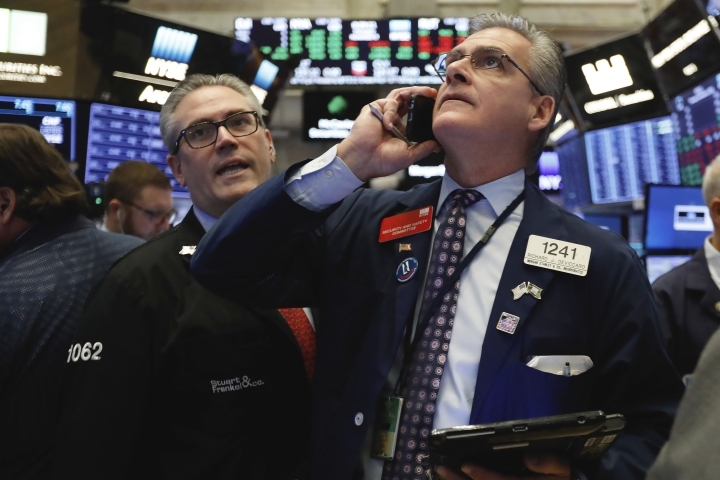 The Dow Jones Industrial Average gained 123.95 points, or 0.5 percent, to 25,413.22. The Nasdaq composite slid 11.16 points, or 0.2 percent, to 7,247.87. The Russell 2000 index of smaller companies picked up 3.41 points, or 0.2 percent, to $1,527.53. But the S&P 500, which finished higher for the second straight day, ended the week with a loss of 1.6 percent. TRADE WORRIES: The Trump administration has imposed a 10 percent tariff on $200 billion of Chinese goods over complaints Beijing steals or pressures foreign companies to hand over technology as the price of market access. That tariff is set to rise to 25 percent in January. Another $50 billion of Chinese goods already is subject to 25 percent duties. Beijing has responded with penalty duties on $110 billion of American goods. Washington and Beijing have resumed talks over their spiraling trade dispute. JAPAN TRADE: Japan reported a trade deficit for October but has seen a recovery in exports after getting slammed by natural disasters in September. Data from the Ministry of Finance showed exports grew 8.2 percent from the same month the previous year. In September, exports fell 1.2 percent from the previous year in the first decline for the world's third-largest economy since 2016. Imports in October grew 19.9 percent on-year. ENERGY: Benchmark U.S. crude oil added 83 cents to $57.51 a barrel. Brent crude, used to price international oils, gained 74 cents to $67.50. CURRENCIES: The dollar fell to 112.69 yen from 113.26 yen late Friday. The euro strengthened to $1.1410 from $1.1339.